Here’s what’s up in the world of TV for Tuesday, July 22. All times are Eastern. 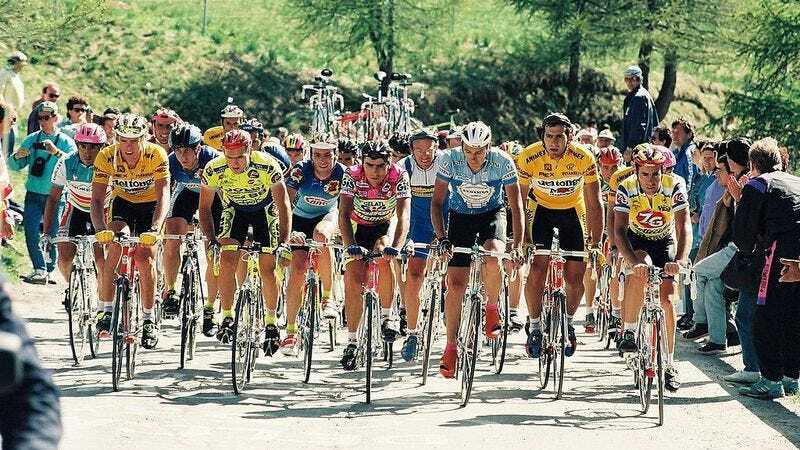 30 For 30 (ESPN, 8 p.m.): As the 101st Tour de France enters its final week of racing, the return of 30 For 30 takes a look back on the 73rd Tour. During that 1986 race Greg LeMond became the first (and technically only now that illegal drug usage has stripped Lance Armstrong and Floyd Landis of their titles) American to win the Tour. LeMond won three Tours in total, but this special focuses on his very first win and his rivalry with fellow teammate Bernard Hinault. LeMond likely sacrificed his own chance to win the race in 1985 to help Hinault, a favor Hinault did not return the following year as he continued to ride aggressively at every opportunity. With so much of cycling’s sheen tarnished by doping scandals, this is a refreshingly upbeat story about LeMond’s triumph. We asked David Kallison to ride along with the peloton and check it out. Food Fighters (NBC, 8 p.m.): This brand new NBC series pits amateur cooks against professional chefs. To even the playing field, the amateurs bring in their best recipes while the professionals have to create dishes on the fly. After watching years of Iron Chef, we don’t see this ending well for the Average Joes. Al Capone: Icon (PBS, 8 p.m.): This PBS special explores the two sides of Al Capone. On the one hand he headed up organized crime. On the other, he fought for expiration dates on milk, thus preventing millions of Americans from accidentally taking a sip of something gross. Tyrant (FX, 10 p.m.): Dennis Perkins gave weekly Tyrant reviews the old college try, however, with his grades never rising higher than a C, we’ve decided not to force him to dissect this show’s flaws anymore. Tonight will be his last weekly review of the show so join him in bidding Abbudin goodbye for now. The Shield (Classic): Brandon Nowalk had planned to bravely barrel into The Shield’s fifth season today. Unfortunately some laptop difficulties have slowed him down so we’ll all have to wait one more week to finally hear his thoughts on Forest Whitaker. Face Off (SyFy, 9 p.m.): SyFy’s makeup design reality show returns for a seventh season. The gimmick of the premiere is that the 16 contestants have to survive “one final audition” to be on the show. Which, in fact, sounds exactly like being on the show. Little Women: LA (Lifetime, 10 p.m.): In this show’s season finale Meg gives birth to twins, Amy returns with Laurie, Jo reconnects with Professor Bhaer, and we finally acknowledge this show is about little people living in LA, not a modern day reimagining of Louisa May Alcott’s Little Women. The Lost World: Jurassic Park (AMC, 8 p.m.): The movie that taught us that the most important skill when escaping dinosaurs is gymnastics. Country Strong (CMT, 8 p.m.): Finally a CMT programming choice that makes sense! Gwyneth Paltrow is an established country star in need of a comeback and Leighton Meester is a “Country Barbie.” Consider this one Nashville: The Movie. Tour de France (NBC Sports, 8 p.m.): After getting an intro to cycling with tonight’s 30 For 30, flip over to NBC Sports to see the conclusion of Stage 16 of this year’s Tour de France. The peloton tackles the longest stage of the tour. The 147 mile course ends with a climb into the Pyrenees that reaches an elevation of 5757 feet. In honor of today’s sports top pick, enjoy this absurd comedy video in which an Irish commentator tries (and fails) to make sense of Olympic sailing.